Nicknamed the "Dean of Moderators" by CNN's Bernard Shaw Lehrer has moderated 12 presidential candidate debates including the first presidential debate between senators Barack Obama and John McCain on September 26 2008. ISBN 0-375-50371-4.
: /ˈlɛərər/; born May 19 1934) is an American journalist and the executive editor and former news anchor for PBS NewsHour on PBS known for his role as a frequent debate moderator during elections. 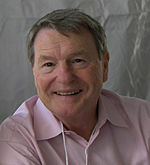 James Charles "Jim" Lehrer (pron.